If you have Jailbroken your iPhone, iPod Touch or iPad on iOS 7 one error that you have probably come across while using Cydia is Failed to fetch […] HTTP/1.1 404 Not Found. This particular message simply means that the location of the address cannot be found, and you have probably came across this error before while searching the net. So just what is causing this particular 404 error every time you refresh your Sources in Cydia? It’s the UltraSn0w repo. For some reason at this moment the repository is either experiencing issues or is down for good. As such you will get an error that states: Some index files failed to download, they have been ignored, or old ones used instead. Although technically this doesn’t cause any issues, it is still an annoyance. Luckily, however, it is an annoyance that can easily be fixed by simply removing the repository. Chances are you will never need to use UltraSn0w so removing it should be a no brainer, and if you ever did need to use it you can re-add the repo back anytime assuming it will be in a functioning state. It is worth noting before we start that this process will work with any repo giving you failed to fetch errors, but you will only want to use this on sources you manually add into Cydia. Removing community sources like BigBoss is never a good idea. 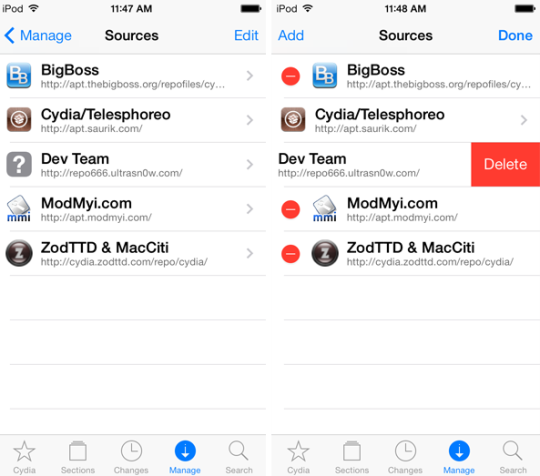 Step 1) – Launch Cydia and go into the Manage tab. Step 2) – Tap on the Sources section. Step 3) – Tap the edit button in the upper right hand corner of the screen and then tap the red minus sign next to Dev Team and delete the Dev Team UltraSn0w repo. Step 4) – Finally tap the done button in the upper right hand corner. And that’s it! No go back into the Changes tab and tap the Refresh button in the upper left hand corner to refresh your sources. You should no longer be presented with a failed to fetch error. Let us know if this was helpful in the comments section. I deleted it and it still says that for most of the repos I have??? I can’t delete it… It doesn’t give me that option.